"You can't trust people you meet at night." GKids has released an official US trailer for a wacky, super fun Japanese anime titled The Night is Short, Walk On Girl, which premiered at film festivals last year and is getting a US release this August. The film is the latest from Japanese filmmaker Masaaki Yuasa, who also made the musical Lu Over the Wall opening this year as well. The Night is Short, Walk On Girl is set over the course of one weird, "insanely long" night in Kyoto, following a teen girl only known as "The Girl with Black Hair" (or "Otome") as she experiences the nightlife. She's also pursued by a boy named Senpai, who comes up with awkward ways to bump into her. The Japanese voice cast features Gen Hoshino, Kana Hanazawa, Hiroshi Kamiya, Ryuji Akiyama, Kazuya Nakai, Yuko Kaida, and Hiroyuki Yoshino. I'm not the biggest fan of this animation style, but this just looks like so much amusing, happy fun. Enjoy! From the visionary mind of director Masaaki Yuasa comes The Night is Short, Walk On Girl, a comedy about one epic night in Kyoto. As a group of teens go out for a night on the town, a sophomore known only as "The Girl with Black Hair" experiences a series of surreal encounters with the local nightlife… all the while unaware of the romantic longings of Senpai, a fellow student who has been creating increasingly fantastic and contrived reasons to run into her, in an effort to win her heart. 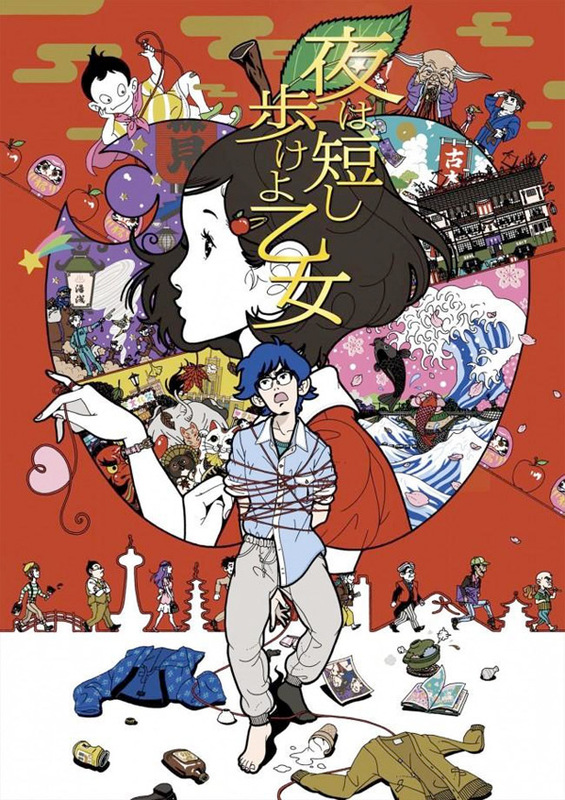 The Night is Short, Walk On is directed by acclaimed Japanese filmmaker Masaaki Yuasa, of the films Mind Game, Genius Party, and Lu Over the Wall (also released this year) previously, plus Adventure Time's "Food Chain". The screenplay is written by Makoto Ueda, based on the novel by Tomihiko Morimi. This first premiered at the Shanghai and Fantasia Film Festivals last year, and also played at Sitges. 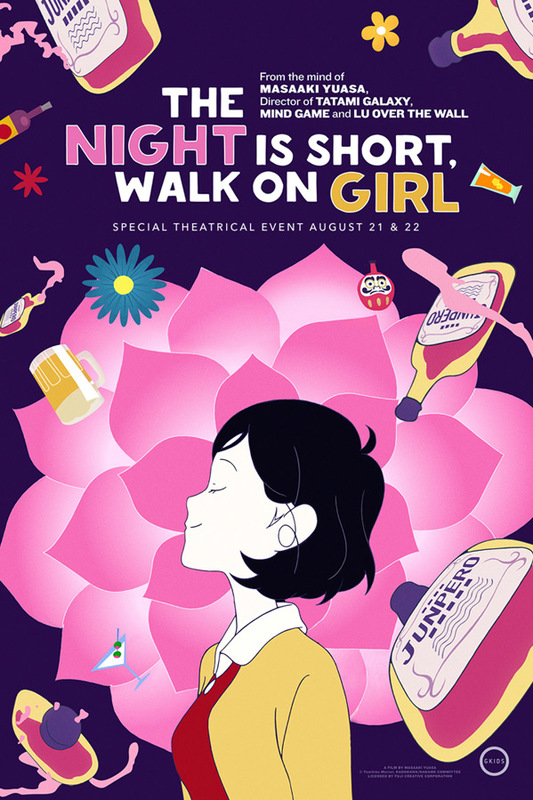 GKids Films will release Yuasa's The Night is Short, Walk On Girl in select theaters starting on August 21st next month. Who's curious about seeing it?